American Private Wealth prides itself on its independence: the Firm is not aligned with any product manufacturer. We therefore have the freedom to deliver objective and un-conflicted strategies using a multitude of sources, in lieu of obeying a seller’s restrictions. We are not in this business to sell a product, but instead to develop genuine relationships that are mutually beneficial and serve to protect your future. To be happy doing well by doing good. Clients of American Private Wealth can expect their assets, in all capacities, to be in qualified, responsible hands. Our strategies are described as ‘bespoke’, a term defined in the Merriam-Webster dictionary as “an adjective for anything commissioned to a particular specification. It may be altered or tailored to the customs, tastes, or usage of an individual.” We recognize that there is not one wealth management strategy out there that will satisfy every client’s needs, and this is why we are committed to forming meaningful client-advisor relationships. To truly understand your financial needs, we know we must first understand you. At the heart of our business is service. Our mission is to deliver customized service that addresses your unique, comprehensive financial needs. Whether you are accumulating for, nearing retirement or have already retired, we can help you navigate the various phases. From your business career, to entering retirement, to experiencing divorce or widowhood, we recognize that you have specific financial needs as a woman. Researching, selecting, deploying and continuously monitoring investments that reflect your unique portfolio is a key commitment of your Firm. We are strong proponents of ongoing comprehensive financial planning. Feel assured that with us, your wealth in its entirety is accounted for. Although exciting and rewarding, accumulating wealth involves preparation for unexpected events. We are here to be your first line of defense. A personalized strategy is crucial to address that what you have built and accumulated is efficiently passed on to your loved ones or causes. Our counsel for business owners is tailored to suit every variety: large or small, start-up or established, growing or looking to exit. Despite our Firm’s belief in doing what works traditionally, we know that keeping current is important. We don’t shy away from the here and now. We want you to remember that we are real people you can connect with, not just a program following protocol. Join Founder Kashif Ahmed on Twitter for commentary on news in the financial world and beyond. Imagine having your financial life completely organized. From investments and bank accounts to credit cards and rewards points, our comprehensive, secure system tracks it all for you. You can even track spending against a budget and utilize the Vault feature to store all of your important documents in one place. 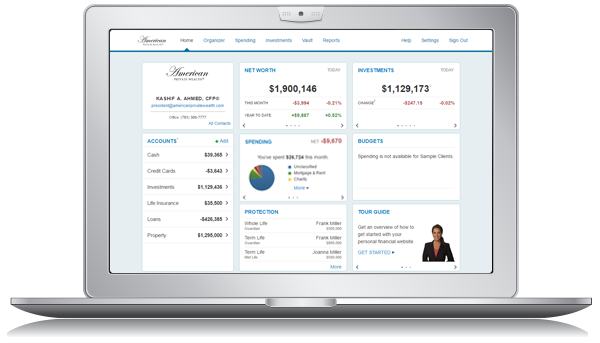 The Personal Financial Website is an exclusive benefit of clients of American Private Wealth. We invite you to learn more about this incredible tool. American Private Wealth is powered by the vast resources of LPL Financial, the nation’s largest independent broker/dealer*. LPL Financial provides a comprehensive array of tools and resources to independent financial advisors, enabling them to provide objective financial guidance to their clients. The firm has no proprietary products. Visit www.lpl.com or browse our Digital Library for more information about LPL Financial. *As reported by Financial Planning magazine, June 1996 – 2016, based on total revenue. At American Private Wealth, our specialized services are available through introduction from a current client or associate. We also accept requests from the public on a case by case basis. Please fill out the form below to schedule a consult where we can determine if an association will prove beneficial.